Last year, 2018, was the second sunniest UK year on record according to the Met Office, with 1575 hours of sunshine landing on our solar panels. We generated 445,876 kWh of electricity, more than 10% above that predicted in our share offer documents. Dorset Community Energy (DCE) members benefitted from an interest payment of 5.5% in September. 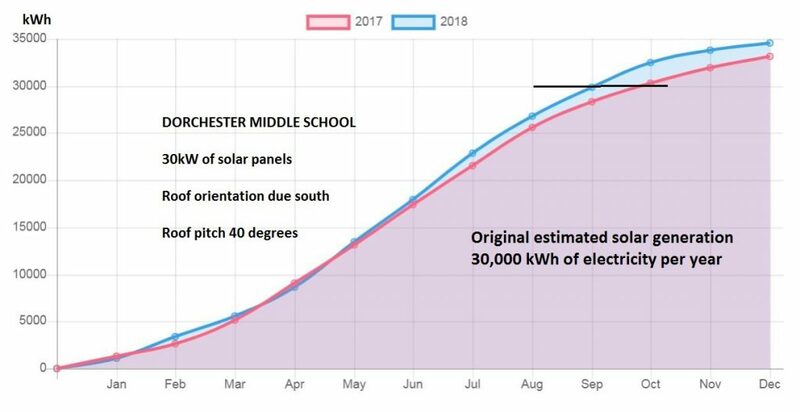 The graphic shows the electricity generated at Dorchester Middle School in 2017 and 2018. The installation was predicted to generate 30,000kWh per year, this figure was reached by October in 2017 and September in 2018. In 2018, the total generation was almost 35,000kWh, resulting in additional financial savings for the school. All DCE sites exceeded predicted generation in 2018, for a full list of generation at each of our sites click here.